There was a bit of a dust-up at the gate to Progressive Field in Cleveland a few weeks ago as we stood in line to get into the game against the Twins. A man had ducked out of line to buy a game program, only to find out no scorecard was included. True to his generation, he was distraught that another chip had appeared in the bedrock game of the nation. The scorecard, it seems, is dead. Patrick Reusse told us as much Saturday in his excellent essay on nine baseball traditions that have disappeared. “It is an art, and if you look around Target Field, you will find it to be almost lost,” he observed. Curiously, documenting the demise of the lost art has suddenly gotten popular. Last Thursday, the New York Times considered the changing cultural landscape and found, predictably, generational reasons. “The reason young people don’t do it is because the next generation is all about speed and efficiency, not about detail,” Yankee fan Stephan Loewenthil told the scribe. Consider, first, that keeping score is not just a matter of recording the game. It is, rather, a way of thinking about the game. The score keeper asks, what is happening? Is that an earned run? Did the runner reach first on a fielder’s choice, or did he get a hit? Is that a sacrifice, or was the batter bunting for a hit? In order to keep score, you need to make these kinds of decisions. And in order to make these kinds of decisions you need to be closely engaged with the game. You need to pay attention. You need to understand what is going on. You need to have skill. You need to care. The irony is that baseball score keeping is a pitch right in the wheelhouse of a younger generation, a generation that documents everything, usually with a cellphone. It’s a different way of taking pictures. I have hand-written journals from my past that are like little time machines. That’s one way of keeping score. And it’s their imperfect nature that gives them character: the dog-eared pages, the changes in the slant and shape of the letters that reflect my mood at the time, a picture drawn in the margin, the wine and food stains. I suppose I could have a nicely styled digital version, a blog or some such, but it would never ‘keep score’ with the same depth and breadth of my manual scribblings. I also find it fascinating to read them years later and realize how much the past has changed, and keeps changing. Today, I went to the Depository of All Things Important But Rarely Seen — the closet in the den — and dug around until I found these four scorecards I’d forgotten I had: Shea Stadium in 1985, Busch Stadium in St. Louis in 1994, Jacob’s Field in Cleveland in 1994, and the Metrodome in 1994. Why I saved them, I don’t know, but each provided a unique snapshot of a moment for which I had no pictures. July 24, 1985 was a day off for me when I worked in New York. It was a Thursday and the Mets had senior citizen discount day games on Thursdays back then. The scorecard reveals Pete Rose was playing. It was the last season in which he’d appear in more than 100 games. It also reveals the game was pretty dull, since I started sketching Shea Stadium. That must be the “art” Reusse was talking about. The notes in the Coke logos reveal I was much more descriptive than I usually was (click image to enlarge). Kirby Puckett’s hitting streak ended at 22 that day, I noted. But you know what I remember? My son dropping his baseball glove into the Twins’ bullpen. Don’t ask me why. That’s baseball. This game between the Pirates and Cardinals was my first exposure to St. Louis baseball, a baseball town like no other. The scorecard says I was in town for a conference of investigative reporters. But the scoring stops in the 7th inning. The game was delayed by rain — lightning really. I was sitting in the last row at the very top of the old Busch Stadium when the lightning bolt hit not far away. The players ran off the field, the 42,000 people scurried for cover. I stayed after thinking, “I can’t think of a better way to go than being hit by lightning at a baseball game.” I should’ve written that down. And this one from Jacob’s Field brought back particular memories. We had moved to Minnesota just two years earlier and we were driving back to Massachusetts, stopping first to see the new ballpark in Cleveland and meet other fans I’d met online (this was the early days of the web). I wrote that we sat in Section 255 Row U, Seats 1-4, a skyview spot to watch the ascension of one franchise, and the pitiful decline of another. A few weeks after this game, baseball went on strike and the season was never completed. But there was something more significant to this game. It was the last time I ever bought a scorecard and kept score at a baseball game. As a softball coach for 9-13 year olds, we have to keep score of the games we are coaching because none of the parents know how to do it. I have made it part of the teaching I do now. When they are on the bench, they help me score the game. When there is a pop up in the infield (no infield fly rule at this level), the pitcher yells out who gets it, and I make them yell the position number, not names. Small things, I know, but trying my best to never hear, “What are you doing drawing those pictures during the game?” again. I score every game I go to (except for one per year when I give myself a break) so when I showed up to four games at Dodger Stadium last month with my trusty book, I may as well have been a zoo animal. I’m proud to say I got all 21 hits and 16 runs the Phillies scored on June 28 along with all the substitutions that a 16-1 rout offers, including an infielder pitching. For the longest time I spent a dollar to buy a program that subsequently got thrown away. One day I realized for $6 I can get a whole book that I can keep along with the ticket stubs that I have going back to 1992. My third book is about to get full, and instead of buying a new one I might print together a design I made that is better suited to scoring MLB games than the little league/softball books available in most stores and specifically made to be friendly to a lefty. As for why people don’t do it as much anymore, who can be sure. One reason might be the change from the ballpark as “the ballpark” to the ballpark as an entertainment venue. To score a game you have to be there for the first pitch AND stay in your seat the entire 9 innings. No spending an inning with your friends in one of the bars or walking halfway around the stadium for a turkey leg. Unless your seat is in the right place you can hardly have time to use the bathroom or get a hot dog. 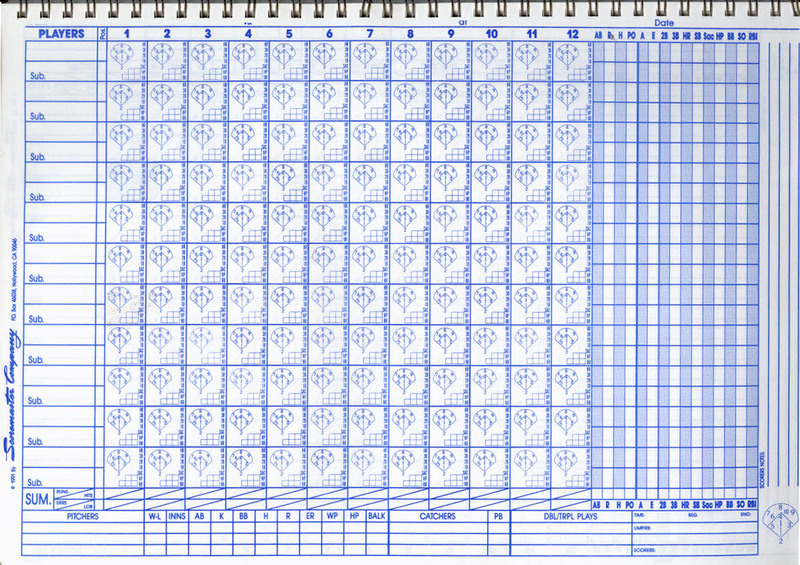 The other thing is the advent of the baseball scoreboard. Back in the day, we had no record of what a guy did in his previous 3 ABs. We didn’t have ANY stats. The scorecard took care of that problem. Kevin, I recommend the Halfliner Scorebook from The Eephus League. I bought one and really love it. Thanks. I do balls and strikes, so I need one with boxes to accommodate all those little marks. A friend of my scores almost every Tigers game he watches on TV or listens to, and definitely when he’s there in person. I scored the Twins-Royals game on June 30, first one I could remember doing since middle school (15 years). I was so proud when all the row and columns added up at the end of the game. I have all my scorecards dating back to the early 1990’s. I have several hundred games in my books and still bring it the few times I go to Target Field each year. I remember being asked quite a few times if I was a scout because my book was so thorough even though I was just a junior high student. Your loss — I still score every MLB game I’m at and my 15-year-old daughter is an eager learner of the art herself. I don’t score every game but a scorecard helps me keep my head in the game, which is becoming increasingly important as MLB adds entertainment (distractions) like racing corporate logos and jewelry inspired kiss cams. Guess I should have kept my scorecards, I throw them in a trash can on the way out of the ballpark – I’ve already got enough stuff around the archives. On the fourth a young lady sat next to my spouse, turns out she rode the bus all night from Chicago to see the Yankees and our new ballpark. She kept a scorecard! Four years ago, I bought a book for my now-11 year-old son and I to keep score at every game that we attend together. It is already a treat to haul it out for our first game of each year and look back at games. I hope that it will be a treasure to him long after I’m gone. I recently unearthed a scorecard from when I saw the Indians play the Yankees at old Cleveland Stadium. Two guys named Mantle and Maris were in the outfield for the Yanks that day, and my scorecard shows just how they did. Glad I kept it! Very cool set of scorecards. I cannot wait to teach my sons how to score a game. From a quick census of teammates on my softball teams, it’s a lost art among that group. Or they’re just lazy and don’t want to score for an inning. I’ll finally make it to my first Twins game of the year on Friday against Cleveland. I’m sure I’ll have scorecard in hand. I did the scorecard for fun when I was in little league. Then I did it a few times watching the Brewers on TV. Then for real as an assistant coach of my brother’s team a couple years later in the early 90s. This was when I learned what a backwards K means. My scorecards were littered with them. When I think back on that, it was obviously not just for entertainment. Each team kept its own scorecard, in part, in case there was ever a dispute or question during play. Anybody who really cares about the detail of the game has awesome resources at your fingertips if you can’t or won’t be bothered with an oldstyle scorecard. Baseball-reference.com is amazing.